Italy, probably Florence, ca. 1485-1490. 210 leaves (1 column, 13 lines), bound : vellum, ill. ; 74 x 53 mm. Allegedly once owned by Lucrezia Tornabuoni, mother of Lorenzo the Magnificent; Mortimer L. Schiff (bookplate on front pastedown); John M. Schiff; his sale (London, Sotheby's, 7 December 1938, lot. 1854); purchased by Julia Parker Wightman in 1966; no JPW number; Julia Parker Wightman Bequest in 1994. 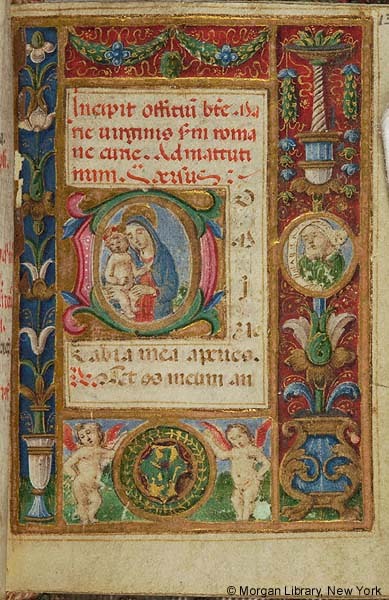 Ms. book of hours, use of Rome (Hours of the Virgin); written and illuminated in Italy, probably Florence, ca. 1485-1490. Decoration: 3 historiated initials, 4 historiated border vignettes, 4 full borders with swags, groteschi, flowers and vases, illuminated initials with partial borders and gold dots at the canonical hours. Decoration in detail: fol. 13 - historiated initial D with Virgin and Child, full illuminated border with swags, illusionistic vases with foliage and plants, small medallion with prophet and scroll; border vignette with 2 putti flanking wreathed medallion with coat of arms (or a lion rampant azur) fol. 108 - historiated initial D with King David and Harp, historiated border vignette with David in Penitence; full border with swags and groteschi. fol. 139 - historiated border vignette with Crucifixion, Virgin & St. John; full border with swags, flowers. fol. 152 - historiated initial with skeleton holding scythe; historiated border vignette depicting a brown-robed monk contemplating a skull held in the right hand; full border with swags and groteschi. Texts: Hours of the Virgin - fols. 13-105v; fols. 106-107 are ruled but blank; Penitential Psalms and Litany - fols. 108-138v; Office of the Holy Cross - fol.s 139-143; "confessus et contitus" - fol. 143v-146; Stella maris - fols. 146v-148v; Name of Jesus Christ - fols. 148v-149v; Pope Sixtus prayer? - fols. 149v-151v; Office of the Dead - fols. 152-206. Binding: 16th-century? woven or embroidered binding of repeated red and green flowers on a silver wire base over boards, silver clasp and catch, edges gauffered and gilt; preserved in black morocco case by Rivière & Son, stamped in gold on spine: Officium Beate Marie Virginis Saec. XV - Exemplaire de Lucrezia de Medicis. Textiles: embroidered or woven fabric used on binding.